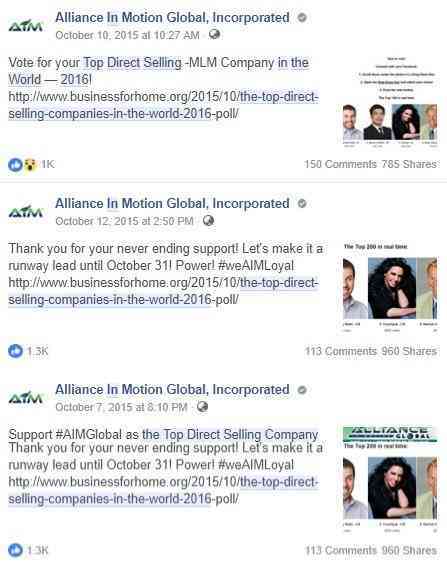 AIM Global or Alliance in Motion Global Review 2019: Legit or Scam? Home » AIM Global or Alliance in Motion Global Review 2019: Legit or Scam? Is AIM Global (Alliance in Motion Global) legit or scam? Read this review and decide if it’s not. Let’s get straight to the point. According to a 15-year study led by Jon M. Taylor, 99% of people who join a recruitment-driven Multi-Level Marketing company lose money. That is not a myth. The numbers don’t lie. Our studies, along with those done by other independent analysts (not connected to the MLM industry), clearly prove that MLM as a business model – with its endless chain of recruitment of participants as primary customers – is flawed, unfair, and deceptive. The US Federal Trade Commission (FTC) published Taylor’s work on their site. So, check that out. Is Alliance in Motion Global an exception to the rule? Can it turn ordinary individuals into extraordinary millionaires? Is AIM Global a pyramid scam? To provide a convincing conclusion, we scanned the web, watched hundreds of videos and analyzed various social media posts. Also, we printed and examined the company’s 2015 and 2014 Financial Statements. Moreover, we compare AIM Global products to similar goods available in the market at a lower price. This detailed review is long. Please use the table of contents to navigate to subsections. It’s a Pyramid Scam. Promises millions in a very short time. Relies on recruitment instead of retails. Did not pass DSAP’s 8-Point Test. Products are overpriced. Allows multiple heads up to 15 accounts. Lots of misleading and false claims. Can You Make Money with AIM Global? Is AIM Global Selling an Unregistered Investment? Operating for more than a decade, AIM Global is a Multi-Level Marketing (MLM) company. Its office address is at unit 301, 319, 320 AIC Burgundy Empire Tower, Corners Garnet and Sapphire Streets, Ortigas Center, Pasig City, Philippines 1600. Eduardo Cabantog, John Asperin, and Francis Miguel are the founders of AIM Global. Alliance in Motion Global, Inc. was registered in the Philippines Securities and Exchange Commission in 2005. The Corporation claims itself as the leading MLM and Direct Selling enterprise with over 5 million distributors across the globe. AIM has more than 100 Business Center Offices in major cities in the Philippines. The firm says it has international offices at Singapore, Taiwan, Brunei, Hawaii, Dubai, Kuwait, Nigeria, Ghana, Togo, Kenya, Uganda, Pakistan, and Papua New Guinea. In its SEC filings, AIM Global reported approximately 1.2 billion and 1.4 billion pesos in sales for the years 20014 and 2015 respectively. Net profit margins were 3.40% and 3.59% during those years. Note: We do not have a copy of its financial statements for the years 2016 and 2017. These files were not uploaded yet in SEC i-View database. However, anyone can request a copy of these reports via SEC Express System. AIM Global sells food supplements, beverages, and beauty products. According to their official website, the company has partnered with Nature’s Way, Weider and DSM to produce their inventories. Below are AIM Global products classified into four main categories and their corresponding prices in Philippine Peso. The product descriptions are taken from their official web page and Usapang Aim YouTube Channel. Warning: The products descriptions are not medical advice. We only quoted how AIM Global describes its products because these will be part of our analysis on the succeeding sections. We also include the prices and some of the ingredients since we will compare these to similar products available in the market. The suggested retail price of this AIM Global product is Php1,320 while distributors price is Php990. This supplement is the company’s flagship product. AIM Global considers this as one of the most nutritionally dense food supplements in the world market today. It contains approximately 22, 000 phytonutrients in every capsule. According to the company, this product provides cellular protection, longevity, nourishment, energizer, and enhancement. What’s even more interesting is that this food supplement provides cardio and cancer protection. Retail price is Php1,250 while distributors price is Php930. It is a lower version of C24/7 minus the anti-aging. It is said the pregnant women and people aged 18 years old and below can take the supplement. It’s a dietary supplement in soft gel form that contains Fish Oil plus Vitamin E that are essential in reducing the body’s bad cholesterol. The retail price is at Php880 while distributors price is Php660. This food supplement is for kids. 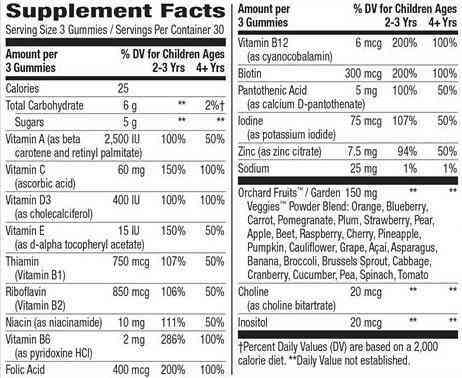 It includes 14 essential vitamins, minerals, and 26 fruits and vegetables in a gummy form that kids will surely love. This AIM Global product does not contain gelatin, yeast, wheat, dairy, gluten, eggs, peanuts, artificial flavors, preservatives, or allergens. Kiddi 24/7 SRP is Php1,100 while distributors can have it for Php750. This product is a blend of extracts from grape seed, Japanese knotweed, and red wine powder. It has an anti-aging formula. The supplement can also be used for people with diabetes because it lowers blood sugar. RestorLyf is selling at Php1,700 at retail while distributors can have it for Php1,250. 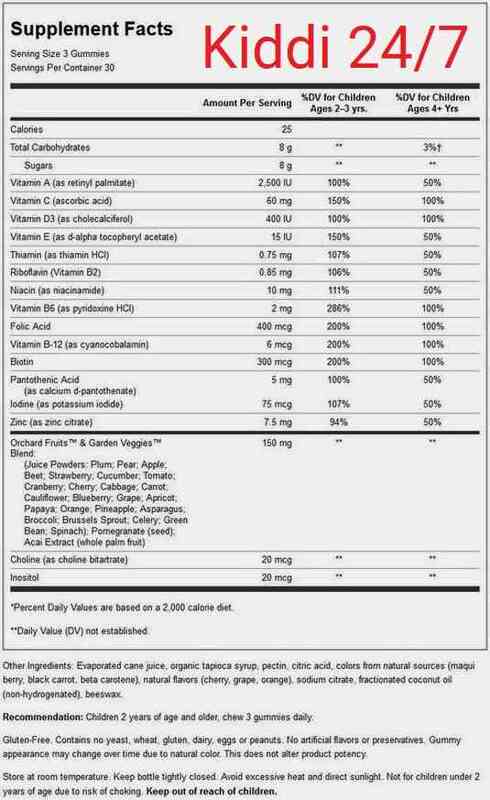 This food supplement has resVida and FruitFlow. ResVida dilates arteries. FruitFlow, a tomato-based ingredient helps maintain normal platelet aggregation, which contributes to healthy blood flow. This product is selling at retail for Php1,900. Distributors can have it for Php1,350. It’s a unique blend of L-Carnitine, Garcinia Cambogia, and Green Tea Extract. The products cost Php1,200 at retail and Php880 if you are a distributor. Burn Slim tablets are said to suppress appetite, increase metabolism and burn excess fat. Suggested retail price of this AIM Global product is Php440 while the distributor’s price is Php330. It contains premium cocoa blend, milk, sugar, alive! mega- nutritionals and DHA powder. The Burn Meal Replace Shake contains high protein ingredients which help shake off hunger and other ingredients instrumental in weight loss. These ingredients include HCA, L-Carnitine, Aloe Vera Gel, Green Tea Extract, Green Coffee Bean Extract, and Guarana. 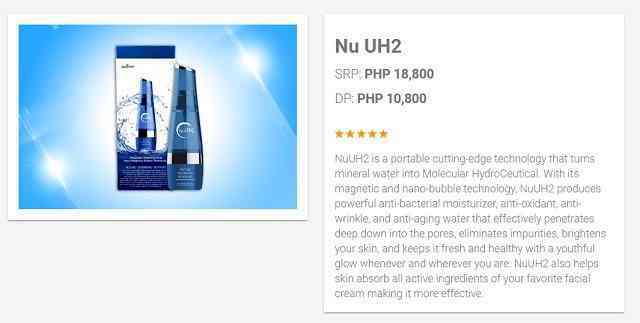 The suggested retail price of this product is Php1,300 while a distributor can buy it at Php950. This drink mix contains resVida and quality carotenoid lycopene to keep your heart in shape. SRP is Php860 while distributor’s price is Php430. AIM Global claims that Liven Coffee is the world’s first alkaline coffee. Due to its 16,000 phytonutrients and 131 natural ingredients, this coffee can provide lots of health benefits. This product is said to be fortified with Complete Phyto-Energizer. The coffee is available for Php390 at retail. If you are a member at AIM Global you can buy it at Php290. According to AIM Global, this product contains Finomate™, a green mate extract with shown effects on weight and body fat reduction. The retail price of this tea is Php1,100. Distributors can buy it at Php770. It’s a Glutathione sublingual spray which contains 2,500 mg glutathione, and 1000 mg Vitamin C. Suggested retail price is Php2,100 while the cost to distributors is Php1,570. Retailing for Php1,650, the active ingredient of AIM Global product is Cysteine Peptide. A member can buy it for Php1,250. This product contains Naturacentials Deep Cleansing & Whitening Bar. The SRP is Php200 while DP is Php150. This feminine wash is said to contain negative ion. Buy it for Php250 if you are a member and sell at a retail price of Php350. This AIM Global product contains negative ion. Currently sells at a retail price of Php350. Distributors buy it for Php250. Buy it for Php200. If you are a distributor, it only cost you Php150. The company says this toothpaste is enriched with 16,000 phytonutrients from Complete Phyto-Energizer. Below are the company’s latest products with unique product descriptions. Ener-Chi Diffuser. SRP is Php380 while DP is Php200. Ener-Chi Pendant. Retails price is Php6,800 while distributors can buy it for Php3,800. Nu UH2. Distributors price is Php10,800 while SRP is Php18,800. Ultra H2. Suggested retail price is Php38,800 while DP is Php25,800. the development and implementation of a promotional strategy. A marketing plan, according to Investopedia, is a business’s operational document for outreach and advertising to generate leads and reach its target market. A marketing plan pulls together all the campaigns that will be undertaken over a period with additional information on how they will be measured and monitored. It puzzles us why Alliance in Motion Global considers the video below as a marketing plan. The presentation talks on how to earn millions out of Php6,980. The video above is not a marketing plan. Instead, it’s a presentation that sells the idea of becoming rich to the potential members. To be a member of AIM Global, you need to buy a global package worth Php6,980. The different packages include various products which can be sold at retail. The company claims that the value of each package is higher than the price paid by the member. Thus, they argue that you already have a return of your investment upon buying the kit. You can make money in this MLM company in various ways as explained below. Upon buying any of their global packages, you will become a distributor. The package entitles you to 25-50% on all products. You can sell the items at a higher price which should not be below the suggested retail price. You earn Php500 in every person you recruited who bought the global package. Matching Sales Bonus or Paring Bonus is a binary system. 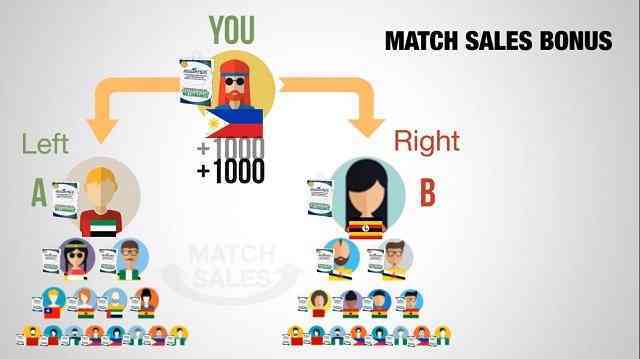 To earn Php1,000, you will recruit two people and put them in your left and right sales team. You will earn Php1,000 once these people under your group invite others to join on their left and right sides. There is no limit as to the level’s deep, but the paring bonus is limited to 32 matches per day. Every 9th and 10th matching bonus entitles you to travel rewards points. You can use these points to avail of the company’s free travel incentive here and abroad. You can earn 5% of product sales volume from the 1st level (direct downlines). Also, you will get 5% of products sales volume from your indirect referrals. The 5% from your indirect referrals sales volume is applicable from 1st level up to the 10th level. All products in AIM Global have corresponding positional points. These points are used for your promotion in their Stair Step Program. In the program, commission ranges 0%-40% based on group’s product sales volume. Our researchers have found several deceptive claims of AIM Global and its distributors. Most of these misleading claims involve company reputation, product benefits and pricing, and advertisements. These false claims do not necessarily mean that the business is a scam. However, these confusing assertions should alert you before joining the MLM firm. AIM Global is said to be the No. 1 Direct Selling Company in the world. The claim is according to their distributors, top earners and the company itself. This statement is misleading. The sole basis of this statement was the online polls published in Business For Home in 2014 and 2015. Dini Noorlander and Ted Nuyten, co-founders, say, Business For Home publishes facts, figures and networking news. It is unfortunate that the exact facts that 99% of people who joins MLM lose money was never published there. Also, they cannot deny the fact that OneCoin, one of the biggest cryptocurrency scams, got good coverage from Ted Nuyten. It was easy for AIM Global to win the No. 1 spot because of their massive Facebook campaigns. See that screenshots below. Ted Nuyten’s Business For Home reported AIM Global’ revenue at $200 million in 2015. The figure was confirmed and published on their page. To verify the claim, our team got a copy of AIM Global’s Audited Financial Statements (FS) for the year 2015. The Philippines SEC duly received these FS. 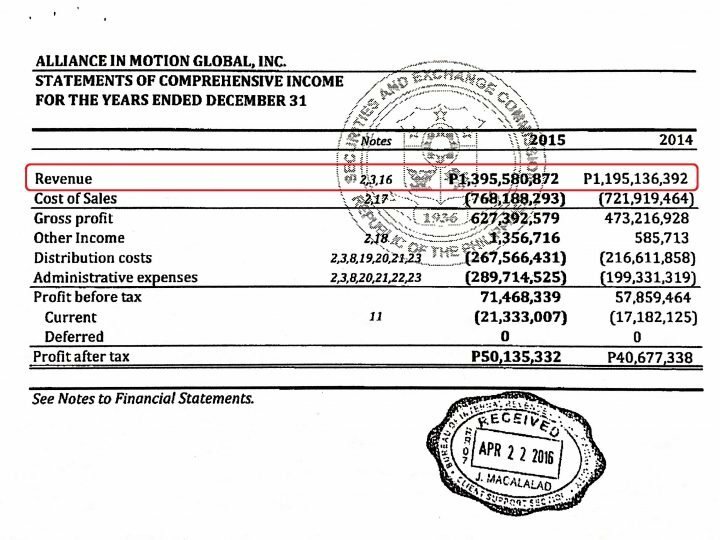 For the year ended December 31, 2015, AIM global disclosed a total of Php1,395,580,872. If we translate this to US dollar using the year-end exchange rate at 46.8522 Php per USD, sales should have been at $30 million. Did Alliance in Motion Global inflate its revenue by 567% for Ted Nuyten? Or, did the company deflate its sales for SEC reporting? We believe the SEC reports are reliable. If this is the case, then we can conclude that Business For Home does not have credibility after all. Likewise, awards received by AIM Global from Ted Nuyten should not matter in the end. A video circulating in social media says that the company is the 30th member of DSAP. This video was published more than three years ago. 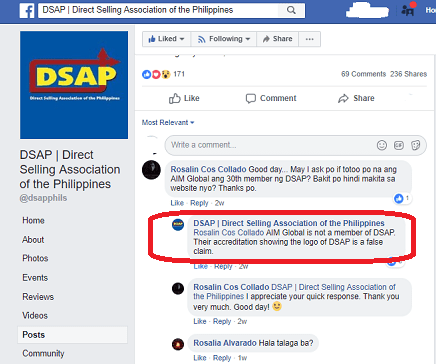 Moreover, one member creates a picture purporting that AIM Global is a member of DSAP. DSAP confirms that Alliance in Motion Global is not a member of their association. 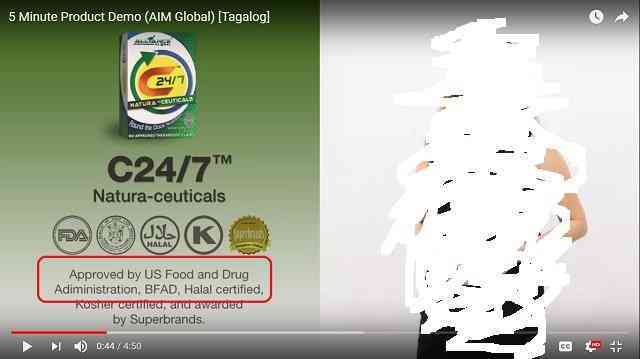 A product presentation in Usapang AIM Youtube Channel says that C247, a flagship product, is US FDA approved. This statement is false. The US FDA is not authorized to review dietary supplement products for safety and effectiveness before they are marketed. Producers and distributors are responsible for making sure their products are safe before they go to the market. No US FDA approval is required. One of the AIM Global’s members is trying to mislead his audience when asked about pyramiding or pyramid scam. Instead of quoting the provision of Republic Act No. 7394 (The Consumer Act of the Philippines), the gentleman talks about pyramid structure. Pyramid structure in an organization reflects hierarchy. For instance, in an organization, executives are at the top, and middle managers are in the middle. Moreover, the rank-and-file are at the bottom of the pyramid. 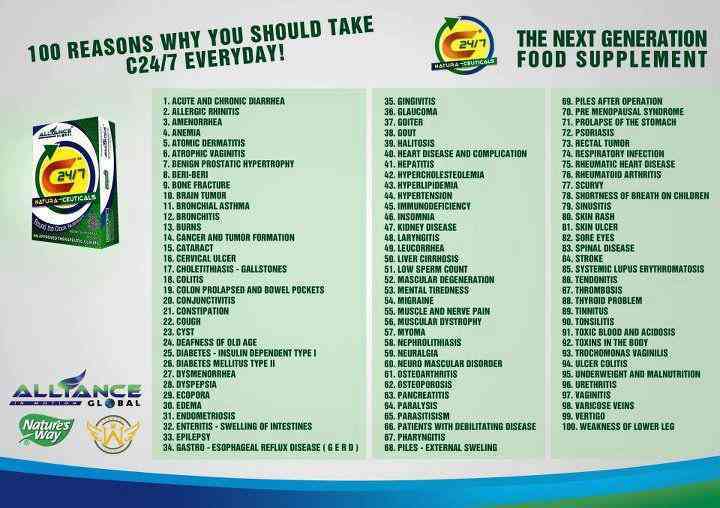 AIM Global and some of its distributors advertise C247 as a food supplement that provides cellular protection, longevity, nourishment, energizer, and enhancement. Also, it states that the product offers cardio and cancer protection. Furthermore, some of the distributors are using a marketing picture, indicating that C247 can protect a person from various diseases. These claims are misleading and perhaps a violation of Article 112 of The Consumer Act of the Philippines. 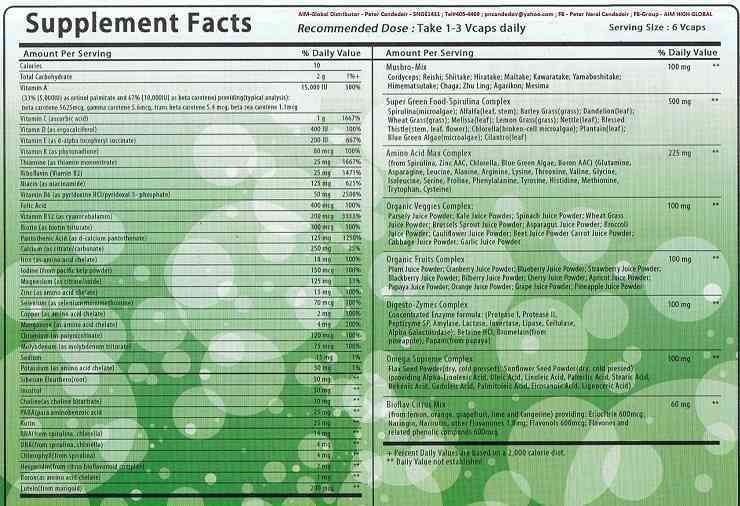 First, we review the ingredients and supplement facts of some AIM Global products. Then, we compare these to similar products available in the market. Our samples include C247, Complete Phyto-Energizer, Kiddi 24/7 and Choleduz. AIM Global disclosed that one of its manufacturers is Nature’s Way. We agree with this claim. Choleduz has the same (except for the amount per serving) content with Fisol. Likewise, the contents of Complete Phyto-Energizer and Alive Max 6 Daily Multivitamin are almost the same. See the photos below. C247 is Complete Phyto-Energizer minus the anti-aging. Alive Premium Gummies for Children and Kiddi 24/7 are identical. Fisol of Nature’s Way costs around Php10-Php11 per soft gel in the market exclusive of shipping fees. However, the retail price of Choleduz is almost Php30 per gel. Granting that the additional servings cost more, still, we find the 200% price difference unreasonable. Since AIM Global can buy in bulk, it can minimize its product cost. The retail price of Alive Max 6 Daily Multivitamin is around Php6-Php7 per vegetable capsule. 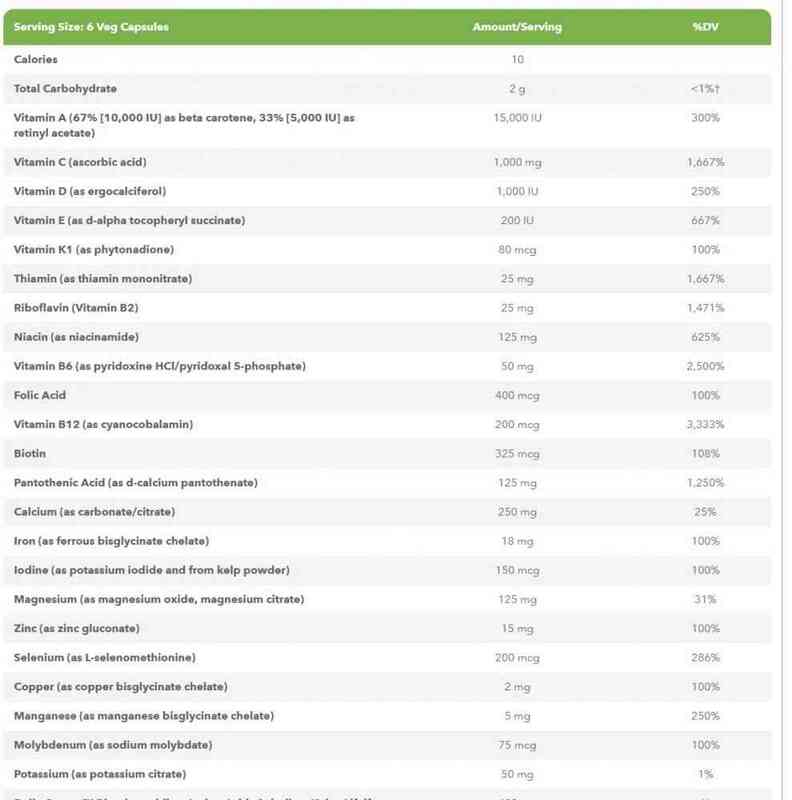 However, Complete Phyto-Energizer costs almost Php42 per cap. That’s a 600% price difference. The suggested retail price of C247 per capsule is Php44. We don’t believe that the additional ingredients would cost that much. Alive Premium Gummies for Children cost only Php8 per gummy in the market. The retail price of Kiddi 247 is Php38 per gummy. 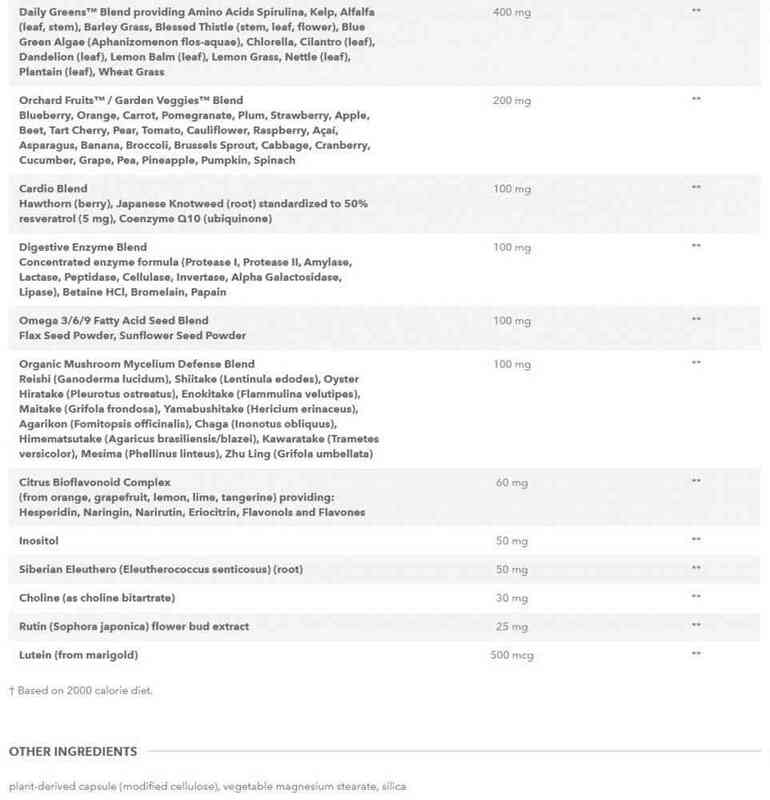 These food supplements are not sold on a per capsule or tablet basis. Nonetheless, you can go to the market and buy these products per bottle at lower prices. 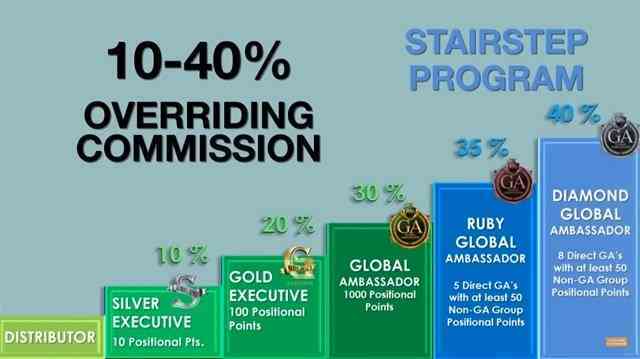 AIM Global products are overpriced because every person on top of the pyramid wants to have a commission. Our answer is a big NO. You can’t make money with recruitment-driven Alliance in Motion Global. Our basis for this conclusion is a 15-year MLM study published on the Federal Trade Commission. AIM Global is not an exception to this independent research. Failure and loss rates for MLMs are not comparable with legitimate small businesses, which have been found to be profitable for 39% over the lifetime of the business; whereas less than 1% of MLM participants profit. MLM makes even gambling look like a safe bet in comparison. AIM Global discloses on its official website that its total distributors are more than 5 million across the globe. However, we found out that as of December 31, 2015, the company had around 10,000 active distributors all over the Philippines. Let’s give Alliance in Motion Global the extreme benefit of a doubt. Assuming, from 10,000 active distributors (the Philippines only) in 2015, the number has increased to 100,000 (all countries) as of this date. 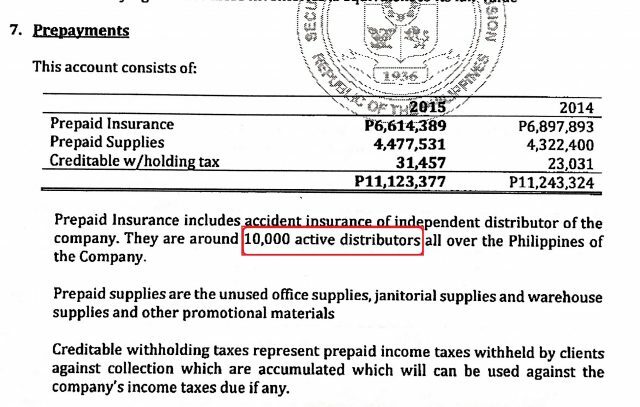 To give more consideration, let’s assume that all 100,000 active distributors made money. That is roughly 2% of 5 million distributors that the company claims. In contrast, almost 4.9 million lose their money because of AIM Global. The numbers are based on a conservative estimate. We expect the figure to be more than 99% because not all active distributors profit at an early stage. AIM Global and those few at the top of the pyramid enriched themselves at the expense of the new recruits. Since nearly all recruits lose money, the income of those people can be considered a theft by deception. If someone says that he became a millionaire in this company, ask the success rate since the start of the operation. First, know the exact number of distributors since 2006 and compare that to the actual members who made money. Then, compute their profits after deducting the expenses. Should we consider AIM Global a legitimate opportunity? Should we call it an income potential where less than 1% makes money? Other AIM Global promoters are so desperate to recruit. See that Kenyan guy below. 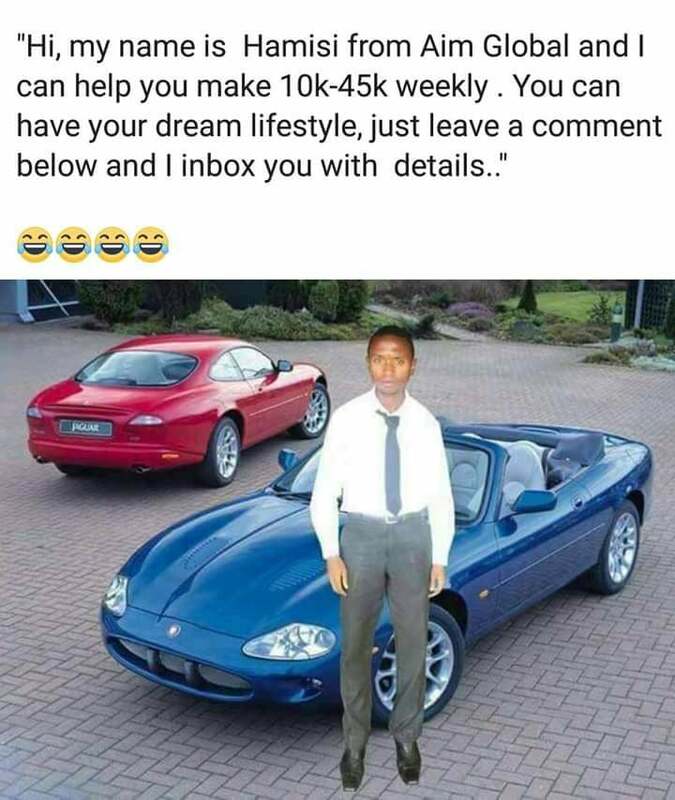 Instead of selling overpriced products, tell him to study the basics of Adobe Photoshop. Pyramid scams can be of two types. One is a naked pyramid (no product) and a product-based pyramid scam. We will use DSAP’S 8-Point Test to determine whether AIM Global is a pyramid scam. Is there a product? Yes, the company has products. Are commissions paid on the sale of products and not on registration/entry fees? No, the company has compensation plans in which commissions are paid based on registration fees of recruits. Is the intent to sell a product, not a position? No, AIM Global intends to sell a position and not a product. It allows a member to purchase up to 15 heads. Is there no direct correlation between the number of recruits and compensation? No, the recruits and compensation are directly correlated. The more you recruit, the more earnings you have. If recruitment were to be stopped today, would the participants still make money? Yes, the members can sell the product at retail. Is there a reasonable product return policy? No, the business has no product return policy. Do products have a fair market value? No, the company’s products have no market value. You can buy similar products in the market at lower prices. Is there a compelling reason to buy? No, there is no compelling reasons to buy their products. Retail customers (not a member of AIM Global) have no intentions to buy the goods. 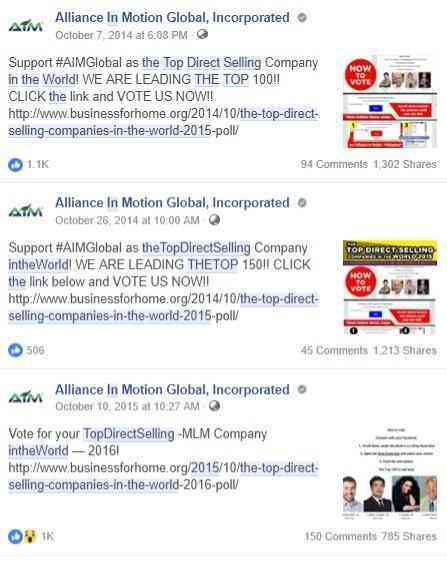 Alliance in Motion Global did not pass the 8-Point Test. We believe that the AIM Global is a Pyramid Scam. An investment contract, according to the Amended IRR of R.A 8799, is a transaction or scheme whereby a person invests his money in a common enterprise. Then, he is led to expect profits primarily from the efforts of others. We think that the company sells an investment contract that requires registration and a Secondary License from the SEC. Its business model satisfies all the requisites of a security. First, a person invests his money by paying the global package worth Php6,980. Second, there is a common enterprise when two or more investors “pool” their resources. In this case, the invested money is under the control of Alliance in Motion Global, Inc.
Then, the company determines as to what to do with the amount. The enterprise uses a portion of the money while a fraction is paid to pay the agreed returns to its members. Third, investors or members are enticed primarily by the prospects of a return on his investment. The investment in money is made with a view of getting profits from AIM Global. The video below tells everything that the company is selling not the usual food supplements. You can find more of that on social media. Last, expected profits in Alliance in Motion arise primarily from the efforts of others. Under the scheme, the accumulated amount received by the investor comes mainly from the efforts of his recruits. Let’s put this on record that the company sells up to 15 accounts. Its clear evidence that the enterprise is offering an unregistered investment. If you want the authorities to investigate AIM Global, you need to file a formal complaint. Pyramids scams are under the jurisdiction of DTI while SEC takes charge of unregistered investments. For DTI concerns, please visit their official website for contact information. For unregistered investments, contact SEC’s Enforcement and Investor Protection Department at 02-818-6337 or 02-818-6047 or email them at [email protected]. Atty. Howard Chan provides a procedure in filing a formal complaint. Please check that out. This review concludes that AIM Global is a Pyramid Scam. The company did not pass the 8-Point Test of DSAP. The Alliance in Motion Global has compensation plans in which commissions are paid based on registration fees of recruits. AIM Global intends to sell a position and not a product. It allows a member to buy up to 15 accounts. Moreover, recruits and compensation are directly correlated. The more you recruit, the higher your earnings will be. The business has no return policy. Also, the company’s products have no market value. You can purchase similar products in the market at lower prices. Ultimately, there are no compelling reasons to buy their products. Retail customers (not a member of AIM Global) have no intentions to buy their food supplements and other items. Also, we believe, that AIM Global is selling an unregistered investment. This investment requires a Secondary License. Moreover, it must be registered with the SEC before it can be sold or offer for sale to the public. Please share this review for public awareness. Please email us if you want to tell a story on how AIM Global enticed you to invest.